The emerald ash borer (EAB) is a very destructive insect pest of ash trees. EAB attacks all species of North American ash. Once an ash is attacked by EAB, it will be killed if it is not protected. Ash trees can be protected from EAB with available insecticides. EAB will move only about 1/2 to 1 mile a year from infested sites. But people can carry it hundreds of miles when transporting firewood and other wood products or nursery stock. Why be concerned about emerald ash borer? Emerald ash borer (Agrilus planipennis) attacks ash trees from as small as one-inch diameter to large mature trees. This exotic borer is a native of Asia. It was first found in Minnesota in May 2009, in St. Paul. EAB has also been found in many other states, as shown on this map from the USDA. It has also been discovered in Ontario and Quebec, Canada. The destructive beetle has killed hundreds of millions of ash trees where it has been discovered. There are nearly one billion ash trees in Minnesota, one of the largest concentrations of ash in the country. Ash trees are abundant in Minnesota forests as well as in urban landscapes. 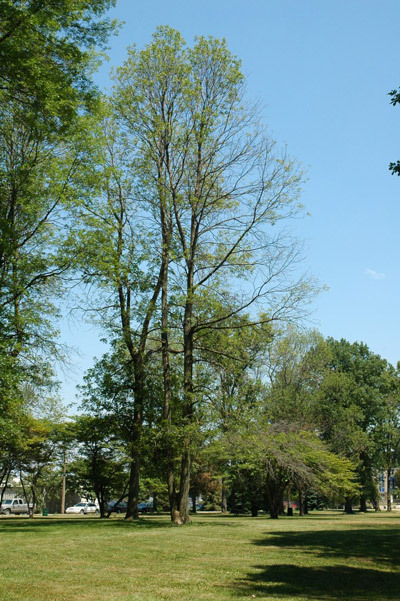 Research has found little to no resistance to EAB in our native ash. 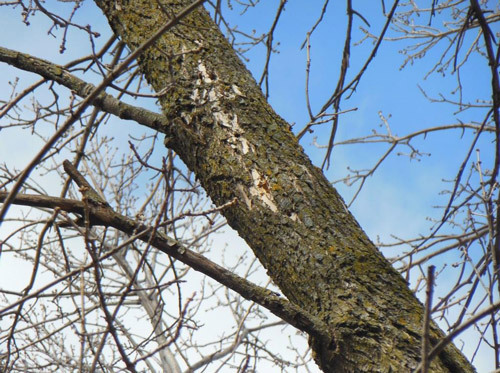 EAB has also been found to attack white fringetree, not commonly planted in Minnesota. EAB is a type of metallic wood boring beetle (family Buprestidae). It is a little larger and much more brightly colored than bronze birch borers and two-lined chestnut borers. 1/3 to 1/2 inch long slender body. Widest just behind the head, gradually tapering back to the abdomen. Bright iridescent green to copper-green. May have a copper colored area behind the head. 1 to 1-1/4 inches when fully grown. White, flat body with small brownish head. A pair of small pincer-like appendages on the tip of the abdomen. First, make sure your tree is an ash. Use this ash tree identification chart from Michigan State University. You may notice insects other than EAB attacking ash. The redheaded ash borer, bark beetles and clearwing borers are the most common native ash borers in Minnesota. 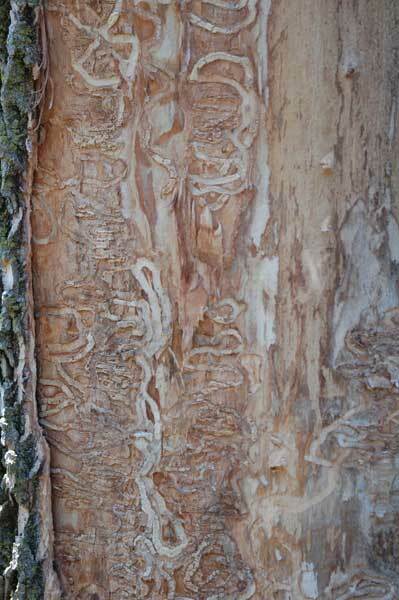 See Native borers and Insects in Minnesota confused with emerald ash borer. Be aware of what emerald ash borer looks like as well as the symptoms of an EAB infested tree. Use this diagnostic tool to see if you can clearly rule out EAB. Report any suspected insects or declining ash trees. If you can't easily rule out EAB, then contact the Minnesota Department of Agriculture (MDA) on their Arrest the Pest phone line at 1-888-545-6684 or arrest.the.pest@state.mn.us to report your suspicions. There have been many cases where the public was the first to find an initial infestation in an area. Don't transport firewood when you go camping or are buying it for home use. Buy the wood you need at local sites or at the campgrounds you are visiting. Most EAB will generally move only about 1/2 to 1 mile a year from infested sites. But with help from people, it can travel hundreds of miles when carried in firewood and other wood products or nursery stock. Ash can tolerate small numbers of EAB larvae. But, as the pest rapidly increases in numbers, the trees are girdled and killed. 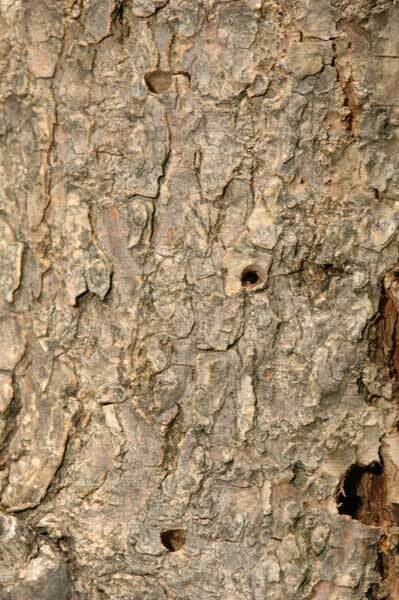 Emerald ash borers generally have a one-year life cycle that can extend to two years in a vigorously growing tree. Adults emerge from ash trees any time from late May to August. After feeding on leaves, adults mate and females lay eggs on the bark or in small cracks. The larvae tunnel under the bark of ash trees and feed until fall. The fully grown larvae live through the winter in chambers constructed under the bark. They transform into pupae in early spring. EAB larvae create winding, S-shaped galleries in the outer sapwood and in the tissue (phloem) that carries food from the leaves to the rest of the tree. Not all galleries in ash are caused by EAB. See also Recognizing insect galleries in ash trees. These tunnels girdle the trunk and branches, interrupting the flow of water and nutrients. The S-shaped galleries become visible if you remove the bark on the trunk. Adults emerge in spring creating small, 1/8-inch D-shaped exit holes. These holes might not be visible right away. Trees are often killed in about four years, although it can take as little as two years. 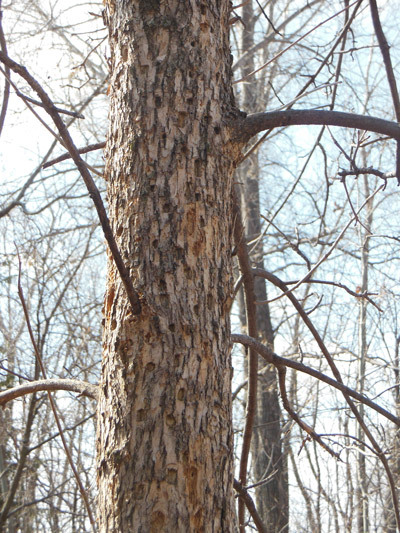 When trees are first attacked by EAB, the symptoms are hard to notice. During the second year, woodpecker pecks and thinning foliage begin to be apparent. By the third year, woodpecker activity is more common and canopy thinning is more pronounced. You may see vertical bark cracks due to the tree trying to heal over old galleries. 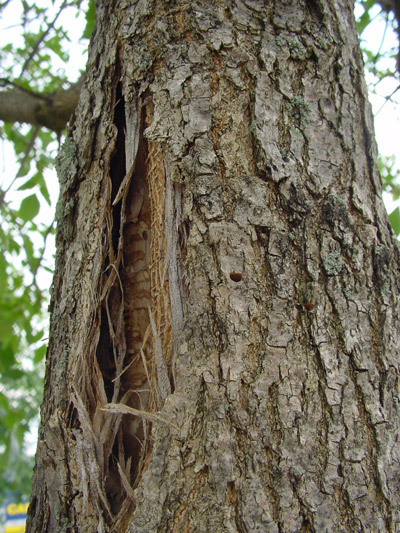 Although woodpecker activity and vertical bark splits are not always caused by EAB, they are common symptoms in EAB infested ash trees. By the fourth year, the canopy has seriously declined and may even be dead. You may see leafy sprouts, especially along the lower trunk. This can happen as a response to emerald ash borer tunneling. This typically occurs when trees are almost dead and does not automatically indicate EAB. There are other problems that can cause an ash tree to decline. Go to What's wrong with my plant? for help in diagnosing an ash problem. Plus sign (+) if content is closed, 'X' if content is open. Should I treat my ash trees? If your ash tree(s) is within 15 miles of a known infestation, it is at a higher risk of being attacked by EAB. EAB has been confirmed in 17 counties in Minnesota (see Minnesota Department of Agriculture EAB status map). If your tree(s) is beyond 15 miles from any known infestation, you do not need to treat it until EAB is confirmed in your area. The further your ash is from a known occurrence of EAB, the less likely that it will become infested. The tree could be protected if it still has most or all of its canopy. If it has lost half of its canopy or more, it is in poor health and treatment might not be effective. If it is a valued tree, you may want to protect it. Healthy, mature trees improve the attractiveness of a landscape, raise property values, help reduce energy costs, and decrease stormwater runoff. The pesticides available for treating EAB have been shown to be effective in protecting ash in University research trials. Some products are available to residents so they can treat ash themselves. Larger ash trees are generally best treated by a professional arborist. Measure the distance around the trunk at 4.5 ft. above the ground and divide it by three to get Diameter at Breast Height (DBH). Trees larger than 15 inches DBH should be treated by a professional. Trees do not build up resistance because of the pesticide applications and need to be treated on a regular basis (every one to three years depending on the pesticide that is used). For specific information on pesticides available for treating EAB, see Emerald Ash Borer: Homeowner Guide to Insecticide Selection, Use, and Environmental Protection. This is a valid option when faced with the risk of EAB. The larger the tree, the more expensive it is to remove. It is easier and less expensive to remove the tree while it is alive. Once an ash tree is dead, the branches become brittle making it much more challenging and dangerous to cut down. You may want to hire a professional arborist to remove your trees. Be sure to ask for certificates of insurance and local references. Get at least two estimates and do not rush into a decision because you are promised a discount. See How to hire a tree care professional. Consider other woody plant options that are available to Minnesotans. See Recommended trees for Minnesota. When there are more diverse types of trees in the urban landscape, neighborhoods can tolerate future pest problems better. If you already have an ash in your yard and it is healthy, there is no reason to remove it. As long as it is a low maintenance plant, keep it in your landscape. We strongly recommend not to plant additional ash. If you have a forest with ash trees in it consider your options by reviewing the Ash Management Guide. Management today can help prepare your forest for a healthy future.